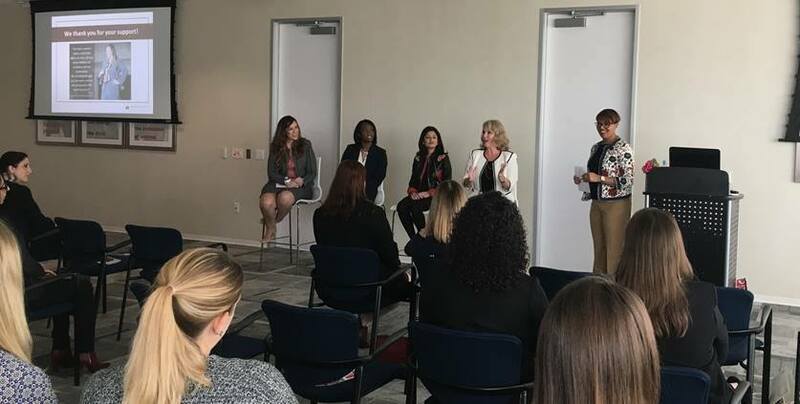 More than 100 women from Baker Hughes, a GE company, DistributionNOW, and PESA Member Companies gathered at Dress for Success Houston on November 10 for a panel discussion about leadership and achieving success throughout a career. This motivational forum, “Leading From Where You Are,” brought together Lauren Levicki, Vice President, Dress for Success Houston, with leading women in the oilfield service and supply sector, including Vera Verdree, Senior Global Competence Manager, Baker Hughes, a GE company; Divya Mittal, Vice President Global Sales, Baker Hughes, a GE company; Elizabeth Stephens, Senior Sales Executive, DistributionNow; and Molly Smart, VP Communications & Member Relations, PESA. PESA is committed to developing and promoting diversity in the industry and supports events such as this one to encourage the advancement of qualified women, people of color and diverse ethnic groups. Dress for Success supports and empowers women to achieve economic independence by providing professional attire, a network of support and developmental tools to help them thrive in work and life. The panel discussion focused on leading no matter what your official title is or where you fall within a company hierarchy. By learning to recognize an issue or place where there is room for innovation and improvement, you can use your skills and voice to speak up and take action that will foster excellence. Of course, personal career progression, the panel said, also comes from being a dedicated employee that recognizes the big picture, as well as the needs of the organization and your supervisor. With the awareness of those necessities, you can better execute projects with accuracy and precision. The panel recommended finding a sponsor or mentor that can endorse your skills and guide your development during your career path. By being intentional in everything that you do, having a vision, defending your ideas, and speaking knowledgeably and eloquently about the issues, you will be able lead from where you are and better serve your organization. This event was hosted by PESA’s Engagement Committee, which is chaired by Advisory Board Member Michelle Lewis, Chief Strategy Officer, DistributionNOW. All PESA committees manage a range of programs designed to train, elevate and network sector professionals and collective member companies. Active engagement with PESA committees is an opportunity for professionals at all levels and their companies to show leadership, network with other industry leaders and gain recognition for helping improve the industry. To get involved in a committee, contact PESA Vice President of Communications and Member Relations Molly Smart. For more information on upcoming PESA events, please visit www.pesa.org/events.